Singer and writer Eric Andersen, artist Alison Harper and myself visited Simon and Edith Vinkenoog in Amsterdam in 2008. Simon and Edith were most gracious in their welcome and hospitality and showed us some wonderful books and artworks from their collection. It was a lovely few hours. Simon talked about his extraordinary life with passion and humour and was delighted to meet Eric. We discussed the Naked Lunch@50: Anniversary Essays book on which I was then working with Oliver Harris, and we talked about William Burroughs, whom Simon knew well and whose writing he very much admired. 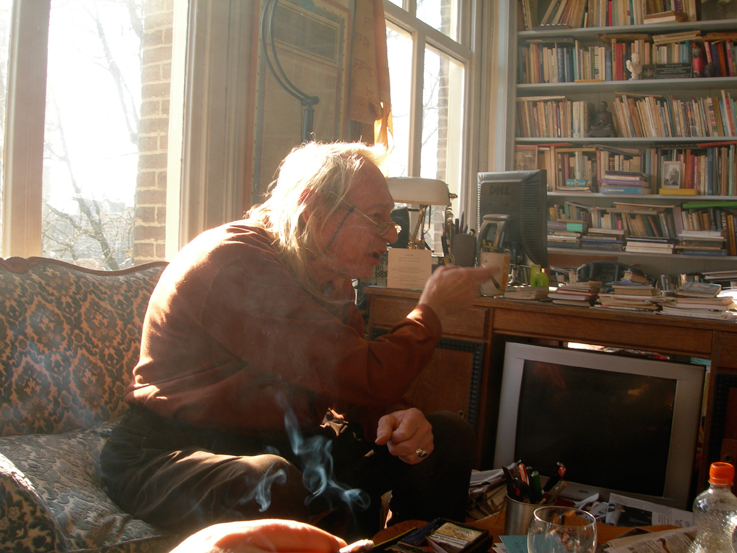 Burroughs was important for the culture of the 1960s, Simon believed, because the startling color imagery and revolutionary technique of his writing exemplified a new way of experiencing consciousness. Burroughs was inspirational through his creative opposition to conventional mores and pieties, his image and his words running through the samizdat little magazines of Europe and the USA and inspiring a younger generation to experiment beyond conventions, beyond art and literature, to refute and then recreate the social conditions of living through a psychedelic experience of multiple “realities.” Simon described Burroughs as the progenitor of a demolition philosophy which promised liberation — and though it failed, apparently, it was a great experiment which continued and would never die away. Simon liked Burroughs personally and was very pleased that the Naked Lunch@50 book was being done. He felt that Naked Lunch was still astonishing and without rival, a brilliant tour de force, a courageous exploration of the psyche. Simon was the very incarnation of the inspired poet who lives an inspiring life, profoundly concerned with libertarian values, a translator and performer of international stature, delighting in the loves and pleasures of the world, and exploring states of consciousness beyond the quotidian fabric of existence. His many books of poetry will remain — powerful, tender, unique, inviolate. We send our sincere condolences to Edith Vinkenoog, to Simon’s family, and to his many friends and admirers. Simon quoted these great lines of Ezra Pound in his book Zonneklar — “What thou lovest will remain / The rest is dross. / What thou lovest shall not be / Reft from thee.” And in his text “High Season,” published in The Book of Grass: An Anthology of Indian Hemp which he co-edited with George Andrews in the 1960s, Simon wrote of “the realm of the archetypes, eternally renewed” — and that is the realm in which his spirit now resides. They just don’t make guys like that anymore. Written by Ian MacFadyen and published by RealityStudio on 14 July 2009. 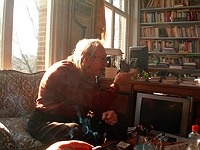 Photograph of Simon Vinkenoog by Alison Harper. For obituaries in English, see Dutch News and Expatica. List of Vinkenoog’s work at Wikipedia. Vinkenoog’s copy of Ticket That Exploded, along with a 1962 letter from Burroughs, is currently listed for sale on Abebooks.